Hello everyone! 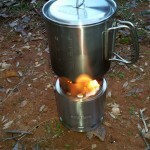 Today I am going to talk about a wood burning backpacking stove made by Solo Stove. 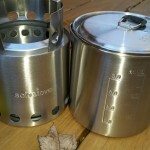 The Solo Stove Lite & the Solo Stove pot 900. Both of these products are made from stainless steel. Both have durable nylon type stuff sacks with drawstrings for storage. 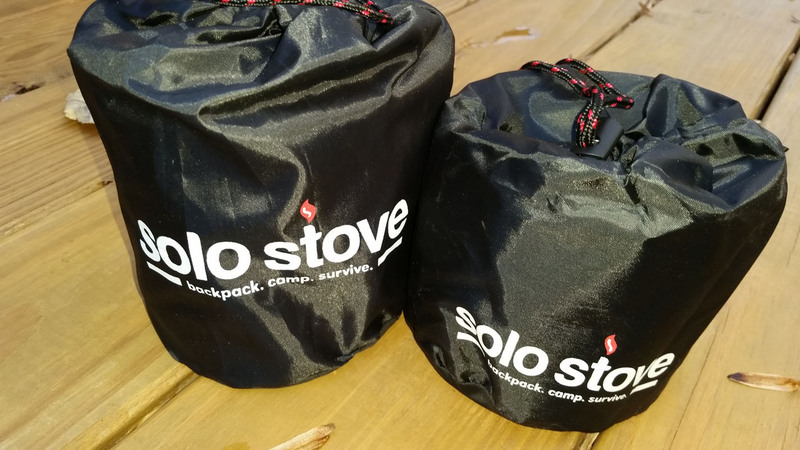 When both are in the stuff sacks — the Solo Pot 900 can nest inside the Solo Stove Lite to make a more compact package to carry. This leaves plenty of room to store your fire starting tools inside the Solo Pot. For example; lighter, flint, matches, fuel starter, esbit, or a small alcohol stove for backup. A complete powerful kitchen all in one package. – Has measurements on the outside & inside. – On the top of the lid — the knob has a rubber piece. this made it easy to lift lid & check food or water. – Shape of handles are like a capital letter D. They stick out far enough on the pot which makes it easy to lift pot off fire. – Ash pan: Catches loose ash and prevents it from clogging vital airflow. The ash pan also acts as a heat shield and prevents your stove from scorching the ground beneath it. – Cooking ring: Directs heat up and towards the center of your pot for maximized efficiency. 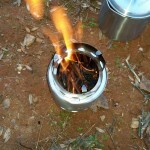 The cooking ring also acts as a windscreen while still allowing oxygen to fuel the flame. The entire cooking ring can be packed into the stove body for compact storage. – Plenty of holes for sufficient airflow. The day I went out to do a test with these two products it was very windy — more of a gusty type wind. I first collected a couple of sticks and broke them down into about 3” sizes. To start, I put skinny pieces of twigs in the Solo Stove first – found a few dry leaves and placed them on top of the sticks — then lit the leaves with a lighter. It took a few times before I got leaves to stay lit long enough to start burning the skinny twigs. The gusty wind was a bit of a hinderance — plus I live just north of Atlanta & just prior to my test had approx 10 days straight of rain. So my sticks & leaves were a bit wet as well. 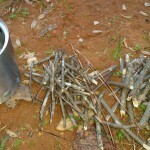 However, it did not take long (prob under 5 mins) for the twigs to catch fire – allowing me to put thicker twigs into the fire. After adding a few thicker sticks — I had a good hot fire going. I then placed the top ring / pot rest on the stove and then placed the Solo Stove Pot 900 onto the stove rest. The wind stayed steady. I kept feeding the fire with various size sticks most of the time to keep a good flame going. How many twigs/sticks will you need? My suggestion is break what you think you might need – then break that same amount again. The amount I started with I probably used double that amount by the time I was done. At one point the fire went out. It was easy enough to pick up the pot, throw a small piece of a leaf on top and blow on it to get it started again. I filled the Solo Stove 900 pot with about 16 oz of cold tap water to do this test. Even in the gusty wind I had a rolling boil in about 10 minutes. I have used a few other small wood burning stoves (comparable size to Solo stove lite) and it seems the Solo Stove lite was easier to start the fire & keep it going. 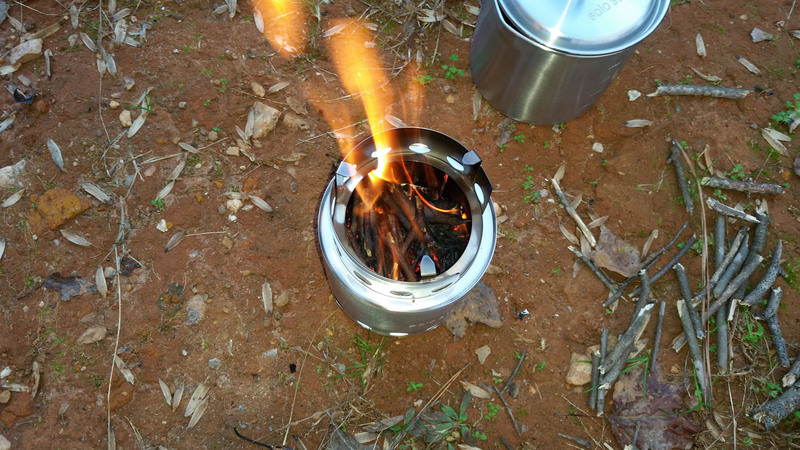 However with this size stove – constantly feeding the container with sticks during most of the burn time is needed if you want a constant flame. There was hardly any smoke with this burn. 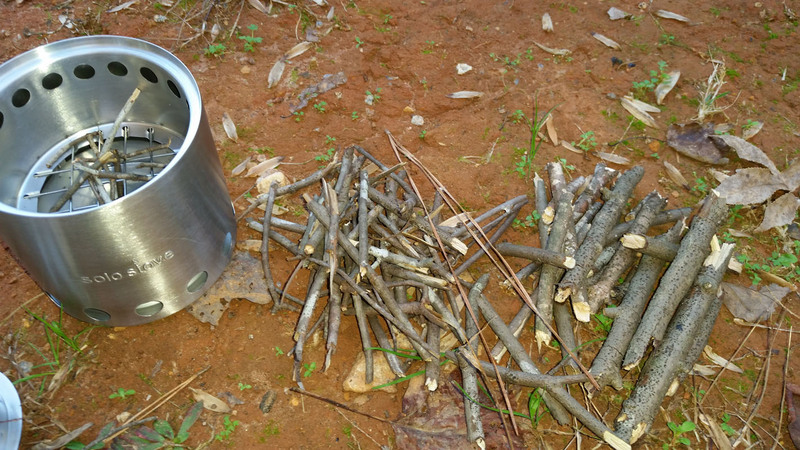 Once the water boiled I let the Solo Stove Lite burn any sticks that were left & cool down. In a short time I was able to pick up the Solo Stove Lite & dump any ash. There seemed to be very little waste in the ash pan compared to the amount of sticks I fed into the stove. I think cleaned the Solo Pot 900 as you would any cook pot in the field. 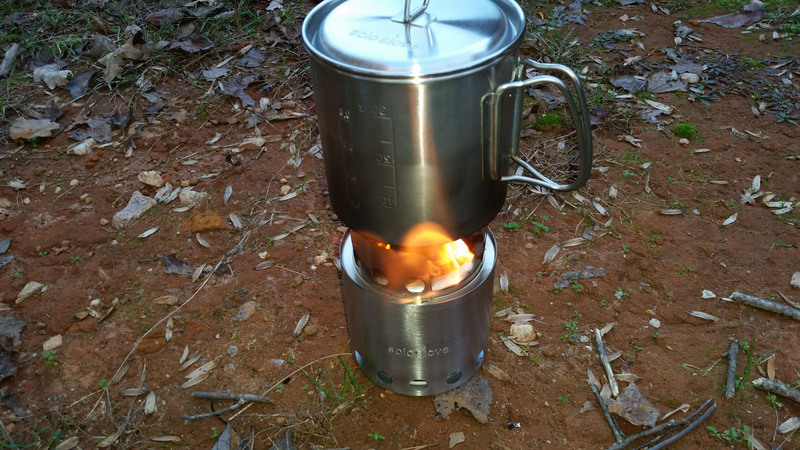 If you are looking for a wood stove to use in the field – the Solo Stove Lite is a workhorse and the Solo Stove Pot 900 makes for a great mate to this stove — A joy to use! Simple. And never have to worry about carrying fuel. Perfect for 1 or 2 people. 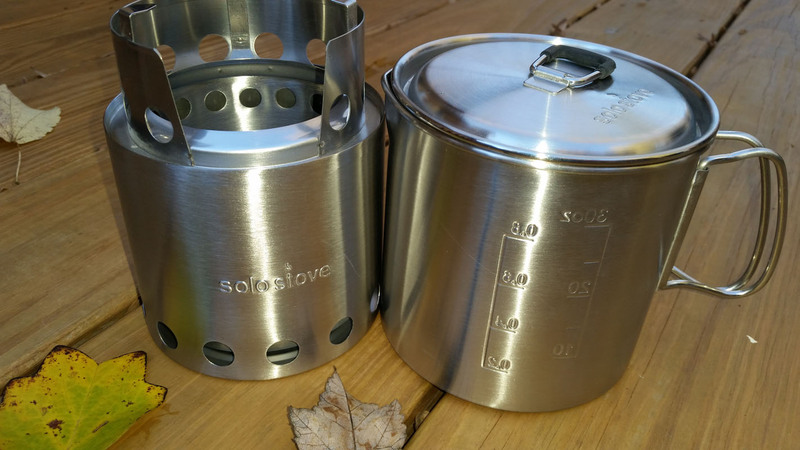 The solo Stove lite is a HOTTIE! Considering the wind I had to deal with – the fire kept burning & was quite hot to get a big pot of water boiling within ten minutes. The particular combination I can see used in various situations. Backpacking, car camping, emergency uses. hunting, boy scouts, preppers…. Thank you for reading & thank you for supporting Outdoortrailgear! 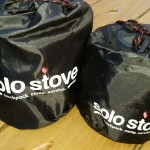 Solo Stove sent me the product free of cost in return to test & write a review. The words & my opinion that I typed above are my own words & opinion. 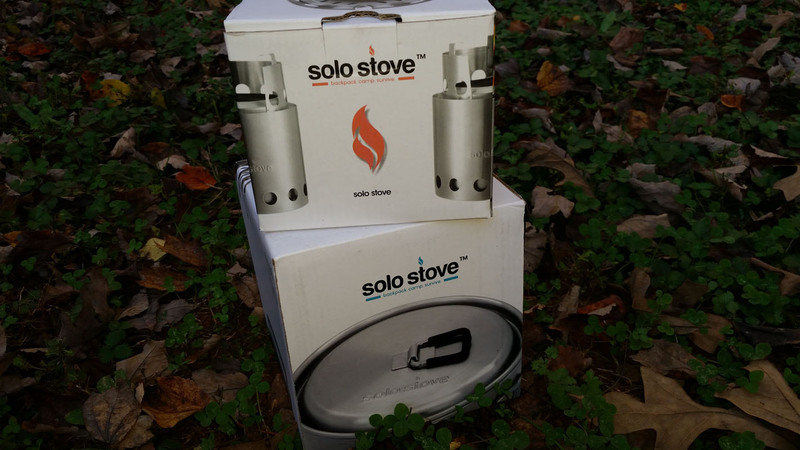 Hi Clare, thankyou for the review, I am curious about one thing..is the solo stove lite a gasifier style stove as it appears to be so? Hey Chris! Thank you for taking time to visit ODTG & read my review. Yes. 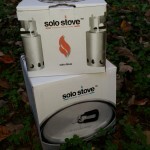 The Solo Stove Lite is a gasifier type stove. Here is wording from the Solo Stove web site. Hope this helps! Designed with a double wall, the Solo Stove is a natural convection inverted downgas gasifer stove. The air intake holes on the bottom of the stove channel air to the bottom of the fire while at the same time, channels warm air up between the walls of the stove. This burst of preheated oxygen feeding back into the firebox through the smaller holes at the top of the stove causes a secondary combustion. This allows the fire to burn more complete which is why there is very little smoke during full burn. A more efficient burn also means you’ll use much less wood compared to an open camp fire.